In an age of uncertainty about how climate change may affect the global food supply, industrial agribusiness promises to keep the world fed. Through the use of factory “farms,” genetic engineering, and the widespread application of chemicals, they put their trust in technology and ask consumers to put our trust in them. However, a look behind the curtain reveals practices that put our soil, water, and health at risk. What are the alternatives? And can they too feed the world? The rapidly growing alternative food system is made up of people reclaiming their connections to their food and their health. A forty-year veteran of this movement, Mark Winne introduces us to innovative “local doers” leading the charge to bring nutritious, sustainable, and affordable food to all. Heeding Emerson’s call to embrace that great American virtue of self-reliance, these leaders in communities all across the country are defying the authority of the food conglomerates and taking matters into their own hands. They are turning urban wastelands into farms, creating local dairy collectives, preserving farmland, and refusing to use genetically modified seed. They are not only bringing food education to children in elementary schools, but also offering cooking classes to adults in diabetes-prone neighborhoods and taking the message to college campuses as well. Such efforts promote food democracy and empower communities to create local food-policy councils, build a neighborhood grocery store in the midst of a food desert, or demand healthier school lunches for their kids. Winne’s hope is that all of these programs, scaled up and adopted more widely, will ultimately allow the alternative food system to dethrone the industrial. Food Rebels, Guerrilla Gardeners, and Smart-Cookin’ Mamas challenges us to go beyond eating local to become part of a larger solution, demanding a system that sustains body and soul. While there can be little doubt that never have so few produced so much food for so many, such abundance has come at a high cost to the environment, human health, food and agricultural workers, farm animals, wildlife, and the social and economic fabric of many American communities. Of course, that harm has not occurred everywhere, or all the time. There are indeed many good, clean, and responsible operators within the system. But there can be little question now that grievous sins have been committed and that the threat to the future is genuine. I don’t wish to restate the long litany of damage here--volumes on that subject already exist--but only to provide a few examples of how the industrial food system has worked its will on the planet and its people. The larger question we face is whether the industrial food system can reform itself. Should we give it a shot at redemption and hope that the positive examples of a few major food system players are indeed harbingers of a new paradigm? Even for those attempting to “get right with their Lord,” we still must ask if the spirit of the Grand Inquisitor is not close to their hearts. Conventional and Factory Farming Conventional agriculture (nonorganic and not making comprehensive use of sustainable farming practices) relies heavily on agricultural chemicals for fertilizer, pesticides, herbicides, and fungicides. One class of pesticides, organophosphates, is made from chemicals derived from World War II-era nerve gases and can damage the mental and physical development of infants and children. Because of their inherent risk, scientists and environmental regulators have requested that the federal government ban twenty organophosphate pesticides. Under the administration of George W. Bush, however, the Environmental Protection Agency (EPA), which has jurisdiction over such matters, permitted the continued use of most of these. In major growing regions of the western United States, such as California’s Central Valley, much of Washington State, Oregon, and southern Arizona, the use of these harmful chemicals to grow the vast majority of America’s fresh food supply continues. Factory farms, also known as confined animal feeding operations (CAFOs), have eclipsed pesticide use in the public’s eye as the most egregious offender in the industrial food system. Whether the land is used for raising dairy cows, beef cattle, poultry, or hogs, major sections of the United States have been “colonized” by these farms and their related operations (cheese-processing facilities, slaughter- and packinghouses), and they are massive in scale. In the eleven states of the western region, there are well over 2000 CAFOs. If one moves east into Texas, one sees enormous numbers of factory dairy and cattle farms; such towns as Hereford and Amarillo suffocate under a hazy pall of stagnant air, feedlot dust, and manure odors. Hogs rule in the Oklahoma Panhandle, where the Kerr Center has documented the decimating effect that industry has had on community life, employment, and the environment, aided and abetted by a local and state political system that’s willing to accept any industry that promises jobs. From Maryland south to North Carolina and Georgia, poultry and hog CAFOs have destroyed waterways, exploited workers (mostly immigrants), and created havoc with air quality. While these operations are responsible for an array of outrageous abuses to people and animals, even worse are their environmental impacts, specifically in the form of air and water damage. Since CAFOs produce ungodly quantities of manure (each dairy cow, for instance, produces four tons of manure per year; one 5,000-head dairy CAFO produces as much excrement as a small city), the primary threat to the environment is in the form of nitrates percolating into both surface water and groundwater. Generally, the amount of seepage into the water supply is controlled by waste management permits granted by EPA and state environmental agencies. But the operative word here is “permit.” Pollution, up to a certain amount, is permitted; anything beyond certain levels (in the case of nitrates, no more than ten parts per million), constitutes a violation. In New Mexico, which has 300,000 dairy cows that produce enough manure each day to fill up nine Olympic-size swimming pools, two-thirds of the state’s 150 dairy CAFOs are in violation of permitted groundwater nitrate levels. And given the process of environmental monitoring and enforcement, it can take years (some are convinced it will never happen) for the state regulators to stop the pollution and force the perpetrators to clean up. In the meantime, residents of dairy CAFO communities endure enormous hardships. Families are unable to have outdoor picnics in the warm weather because the flies are on the food before the Saran Wrap can be removed from the potato salad. One resident of eastern New Mexico told me that the entire southfacing outside wall of his house, normally light-colored stucco, becomes black with flies at certain times of the year. Even though he kills them with an insecticide one day, they are back the next. Groundwater tables have dropped so low due to the high water usage of CAFOs that homeowners must drill their wells deeper at considerable expense, not only for the drilling but also for the higher energy costs associated with pumping water a greater distance. Concern about groundwater contamination has also driven many residents to buy bottled water. Air pollution, which is monitored only sporadically in some parts of New Mexico, is also associated with asthma rates, which tend to run significantly higher in the state’s dairy regions. As the toll mounts from factory livestock production, we see the risk to the public health change from things we can see, smell, or taste (our senses having always been our best defense against danger) to things that are not easily detectable, things that couldn’t even be imagined many years ago. Human resistance to antibiotics is one such threat. A particular strain of bacteria that, according to the Journal of the American Medical Association, is responsible for 19,000 deaths a year in the United States--that’s more than AIDS kills--is winning the war against antibiotics. The widespread nontherapeutic use of antibiotics (using them routinely on livestock as a preventative measure in factory farm situations where the risk of infection is high because animals are so tightly confined) is suspected as a culprit in the skyrocketing number of antibiotic resistance cases in humans. This seems probable given that the Union of Concerned Scientists estimates that at least 70 percent of the antibiotics used in America are fed to livestock on factory farms. Fortunately, the Obama administration is seeking a ban on antibiotic use in farm animals unless it is for the treatment of specific illnesses and done under the supervision of a veterinarian. It can be assumed that the livestock industry will fight the proposed ban, and should it lose the fight now will most likely resume the fight once the political winds shift again. America’s medical community has also spoken out against factory livestock farming. The American Public Health Association called for a moratorium on the development of all future CAFOs until a series of environmental, health, and social issues could be scientifically addressed and resolved. In 2006 the Pew Charitable Trusts convened a commission on industrial farm animal production. This commission issued a report in 2008 recommending new laws regulating pollution from industrial farms, a phasing-out of CAFOs that restrict “natural movement and normal behavior,” a ban on hormones to promote animal growth, and an application of antitrust laws to encourage more competition and less concentration in the livestock industry. Part I: Authority or Freedom? Chapter 3 The Industrial Food System: Ministry of Plenty or Department of Destruction? Chapter 11 Food Citizens, Unite! 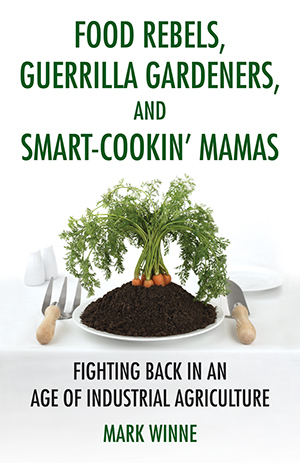 Click here to read a review of Food Rebels, Guerrilla Gardeners, and Smart-Cookin' Mamas on Examiner.com. Click here to read a blog post featuring Mark Winne on "Facing Hunger in America". Click here to listen to an interview featuring Mark Winne on PRI's Living on Earth.